Instantly recognizable, the Eames Lounge 670 Chair is a true design icon that is reminiscent of an old English Club chair. Luxurious and sophisticated, the chair's intelligent design sets new standards for the traditional club chair. It is lighter with more elegance and comfort. The chair is angled for relaxation, with cleverly positioned cushions to offer support where needed. Its classic yet modern frame is carefully crafted from high quality wood and upholstered in soft Italian leather. The five-point base is made from cast aluminium for lightness and stability. A choice of seven colours - black, white, cream, dark brown, brown, camel and sand - make it easy to find the right look for your home. 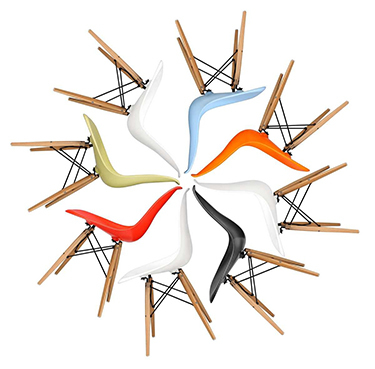 Get the full Eames effect with the addition of the matching Eames 671 foot stool, sold separately. The idea for the Eames Lounge Chair started with a simple question: Why don't we make an updated version of the old English club chair? With this thought, Charles Eames and his wife, Ray set about designing a chair that combined maximum comfort with the finest materials. The process took several years to perfect and the finished result was introduced on NBC's Home show broadcast in 1956. It was an instant success and became a benchmark for how a lounge chair should be. Sometimes known as the Eames 'Relax' Chair because of its undeniable comfort, it is one of the most significant designs of the 20th century. Very nice Chair. Very comfortable and almost exact as the original. Super service from OSKAR - definitely not my last purchase. The product cames with good package. All the details very accurate. Very nice Chair. Very comfortable and almost exact as the original. Super service from Stin - definitely not my last purchase. I bought the replica Eames Lounge Chair & Ottoman from STIN about two weeks ago, after a lot of research. I got a piece of the leather form them to check out and was pretty impressed. I asked them loads of questions about it in person and by email and they were pretty helpful. Eventually I went for it and it arrived the next day (! ), all in one box. Everything was really well packaged and I put it together pretty easily, so no problems there. A couple of notes on the chair itself: I regularly sit on a Herman Miller Eames lounge chair (at work; I can't afford one for my apartment) so I know what it's like - the STIN version is aesthetically very close. The swivel is pretty good, it stays where you leave it, as it should! The leather is nice, it's real leather and smells like it which is great. Overall, it's pretty nice and blows other repros out of the water, if you ask me. Ordered the eames lounge chair in white, but then quickly changed my mind. The very nice customer service girls helped me change it to black - no questions asked. Der Loungestuhl ist einfach nur super und extrem gemütlich! Schade finde ich nur, dass man mir beim Zusammenbau nicht geholfen hat, der Rest war spitze! Wow, definitely not my last purchase. Had a good experience with OSKAR. Super quality and an amazing customer service! The Chair looks the same as the original. Super happy with my purchase! Very good chair. It's really comfortable. I'm Happy with my purchase! A really good chair. Really pleasant to sit in. I’m glad I bought it. This chair gives my living room a really cool retro look. Could also be the most comfortable chair ever..
Wow, definitely not my last purchase. Had a good experience with STIN. Super quality and an amazing customer service! The Chair looks the same as the original. Super happy with my purchase!